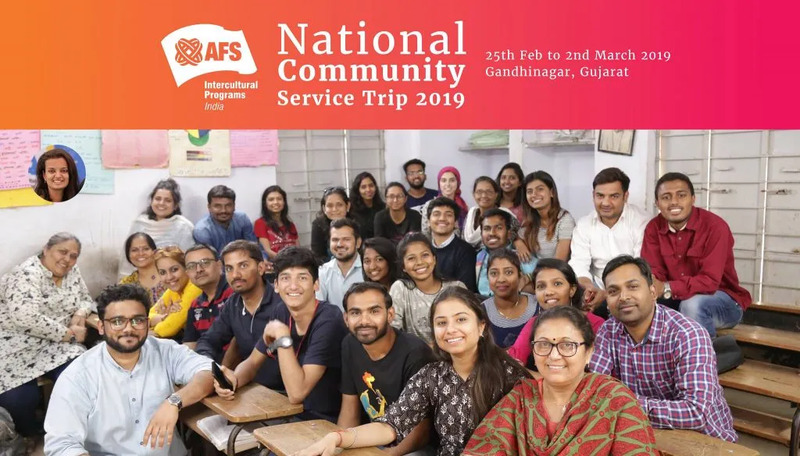 We are happy to announce the successful completion of National Level Community Service Trip 2019 at Gandhinagar from 25th February to 2nd March 2019. The National Level Community Service 2019 was built on the idea of creating social impact where AFS volunteers from Pan-India were invited to join together to address the local challenges and bring diverse communities together by using their skills, knowledge and understanding to execute various projects & activities at a local community. This project was based on the self-sustaining model where the materials and resources needed to execute the community service were either donated in-kind or bought with the money donated the volunteers and other external stakeholders. For this year, we aimed at working with four different schools in the villages of Gandhinagar, Gujarat. We had a total number of 32 volunteers from diverse backgrounds and age group who came forward to help out these schools with different projects. The management and the students of the school were very happy with all the activities which were conducted during the service program. The school students were very keen on learning new things that the volunteers taught them. Not only did the students learned through this program but the volunteers too had a good intercultural learning experience as they were warmly accommodated by the host families at Gandhinagar. With the closing ceremony at the village, volunteers were appreciated and recognized for their commitment to this service trip. We also had the honour of having T.S. Joshi, Director GCERT of Gujarat State as part of the closing ceremony. He interacted with the students and volunteers and appreciated the work done by AFS volunteers to serve the underserved. The service trip ended with a cultural excursion trip to the Statue of Unity, a colossal statue of Indian statesman and independence activist Sardar Vallabhbhai Patel (1875–1950) who was the first Home Minister of independent India. Overall, everyone participated very passionately in the service and put in their level best in creating a social impact through this project. We are grateful to everyone from the volunteers to the school staff to the local authorities and management, to the host families for helping us in the execution of the community service project. Special shout-out to AFS Gandhinagar volunteers for opening their hearts and home to all the volunteers. The hosting experience helped in doing a major cost-reduction in the community service trip. The hosted volunteers also learned and enjoyed the host family experience provided by the volunteers, helping them realize how AFS host students feel when they are hosted in Indian families. The continuous support provided by host families showed the motivation and commitment to AFS’s mission. Gratitude and thanks to the donors who contributed in cash as well as in-kind to make this project successful. Many thanks to donors for becoming supporters of AFS in its work; the donation has helped transform the lives of thousands of students, families and individuals. Thanks to all the volunteers and AFS well-wishers for believing in the AFS’s mission and being part of the AFSeffect.